Ntshondwe Lodge is one of the most spectacularly situated lodges in Africa, suspended on the edge of a cliff, boasting soaring mountains and sweeping vistas across the African plains. Set in the spectacular Ithala Game Reserve, which tumbles a thousand meters over 20 kilometers, from the heights of the Ngotshe Mountain into a deep valley carved by the Phongolo River. This six-bedded lodge has three spacious en-suite bedrooms and a tiered lounge and dining room leading onto a covered deck with barbeque and plunge pool. The lodge is centrally placed to explore the wildlife, history and cultural diversity of the reserve set in the spectacular vistas of rugged mountains, open plains and wild rivers. 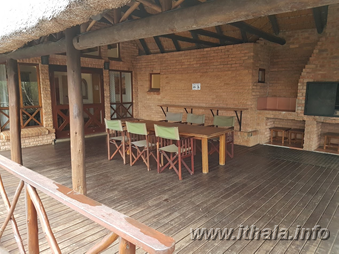 Ntshondwe Lodge has a fully equipped kitchen for guests that wish to prepare their own meals and dine indoor or outdoor while enjoying the natural splendour and tranquility of Ithala Game Reserve .